Can AI Match Humans to Ask Questions? The increasing demand for access to different types of information available online have interested researchers in a broad range of ‘information retrieval’–related areas, such as question answering, topic detection and tracking, summarization, multimedia retrieval, chemical and biological informatics, text structuring, and text mining. Although search engines do a remarkable job in searching through a heap of information, they have certain limitations, as they cannot satisfy the end users’ information need to have more direct access to relevant documents. The main goal of conversational AI systems is to retrieve relevant answers to natural language questions from a collection of documents rather than using keyword matching techniques to extract documents. For some people, questioning comes easily. Their natural inquisitiveness, emotional intelligence, and ability to read people put the ideal question on the tip of their tongue. But most of us don’t ask enough questions, nor do we pose our inquiries in an optimal way. The good news is that by asking questions, we naturally improve our emotional intelligence, which in turn makes us better questioners—a virtuous cycle. 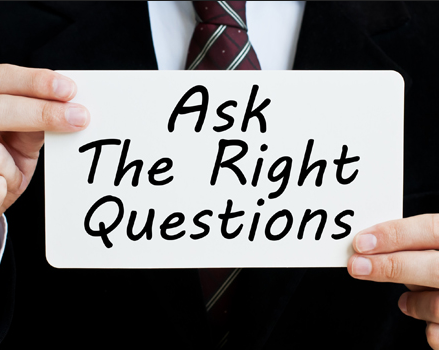 There are few business settings in which asking questions is more important than in sales activities. A recent study of more than 500,000 business-to-business sales conversations by the company Gong.io reveals that top-performing salespeople ask questions differently than their peers. Consistent with past research, the data shows a strong connection between the number of questions a salesperson asks and his or her sales conversion rate (in terms of both securing the next meeting and eventually closing the deal). However, there is a point of diminishing returns. Conversion rates start to drop off after about 14 questions, with 11 to 14 being the optimal range. Taken together, the data from Gong.io affirms what great salespeople intuitively understand: When sellers ask questions rather than just make their pitch, they close more deals. Consequently, the drive to provide business leaders with conversational AI systems to add support to their decision making is gaining momentum. One acquisition is the Canadian AI start-up Maluuba, a company founded in 2011 to conduct research in the field of deep learning and reinforcement learning for question-answering and decision-making systems. While Google’s DeepMind’s focus is on multiple areas like games, healthcare, and speech, Maluuba’s focus is on language. Maluuba would like to create ‘literate machines,’ i.e., machines that can think, reason, and communicate like humans – a complimentary aspiration for Microsoft as one of the largest producers of enterprise software and hardware. Maluuba has ambitiously stated in the past that it wants to create one of the largest deep learning research labs in the world. Some of the research areas on which it has focused include common-sense reasoning, information seeking behavior, machine reading comprehension, and dialog understanding. Another acquisition is the Californian AI start-up Semantic Machines, a company founded in 2014 to apply machine learning to produce bots that respond in a more natural way to queries. Semantic Machines is led by UC Berkeley professor Dan Klein and former Apple chief speech scientist Larry Gillick. Both are considered pioneers in conversational AI. Microsoft’s acquisition will boost the company’s Cortana digital assistant, as well as the company’s Azure Bot Service that’s used by 300,000 developers. “With the acquisition of Semantic Machines, we will establish a conversational AI centre of excellence in Berkeley to push forward the boundaries of what is possible in language interfaces,” explains David Ku, chief technology officer of Microsoft AI & Research. Google is also working on a similar human-sounding AI system. The search giant demonstrated its Google Duplex prototype earlier this year which allows the Google Assistant to call businesses and book hair appointments or restaurants on behalf of Google users. How good are computers at reading and understanding documents? Microsoft announced recently that it had matched human performance on the Stanford Question Answering Dataset (SQuAD). SQuAD has over 100,000 questions, all of which are answered by a section of text in one of 536 Wikipedia articles; the questions were created by internet-based crowd interviews where participants were asked to come up with as many questions as they could, based on a short snippet of an article. It is a big improvement on previous datasets, but it is still not reflective of the kind of open-ended questions users ask search engines. Having large datasets available to train and test with is helping researchers improve the performance of reading comprehension models. However, creating those data sets is slow and expensive, making it harder to use machine reading for topics where there isn’t a good test data set to learn from. To address this problem, a team at Microsoft is using transfer learning to build MRC systems for domains like a new disease, where there are plenty of source documents, but no existing, manually labelled datasets of questions and answers to train on. SynNet is a two-stage synthesis network that first learns what interesting information in a document looks like — key facts, named entities and semantic concepts that are frequently used — synthesizes those into answers and then learns to generate natural language questions that the ‘interesting’ information could answer, using bi-directional Long Short-Term Memory Networks. Once trained, SynNet can be applied to a new domain where it can generate both questions and answers that can be used to train an MRC system. The Maluuba team is working on teaching systems to ask better, more informative questions, using reinforcement learning with rewards focused on what makes the question better — like being fluently phrased. According to Adam Trischler, senior research scientist in the Maluuba team, a system that can ask good questions requires deeper reasoning ability because it must both understand the source document and be able to generate natural language questions. It also must know when the answer to a question can’t be answered fully by a document and when it needs to ask more questions or look for more sources. “Sometimes the information you’re looking for isn’t in the document you have in front of you; your knowledge base is incomplete, and information is missing from it. We want to address the question of when the available knowledge is insufficient: how do you improve or add to it? You explore the limits of what you know and what you don’t know, what you understand and what needs further clarification. As with people, if there’s something we don’t know, one of the first things we do is ask a question. Asking questions is this fundamental behavior we undertake to fill in the gaps and add to knowledge”, Trischler said. Maluuba is trying to create what product manager Rahul Mehrotra describes as ‘literate machines’: machines that can think, reason and communicate like humans, machines that can read text, understand text and then learn how to communicate, whether it’s written or orally. This ability is generally assigned to the realm of artificial general intelligence (AGI) which, to many experts, is still many years away. However, focusing on language as Microsoft is doing, might speed-up the market entry of very powerful tools, for example to enhance corporate decision making. Conversational AI with ‘literate machines’ is likely to revamp or disrupt the organizational decision processes. The CEO isolated from ‘reality’ by his subordinates is a thing of the past. The winner will be a company with far more flexibility adopting to a rapidly changing business environment.